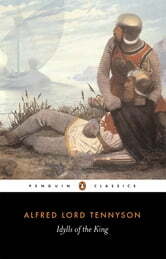 Tennyson had a life-long interest in the legend of King Arthur and after the huge success of his poem 'Morte d'Arthur' he built on the theme with this series of twelve poems, written in two periods of intense creativity over nearly twenty years. Idylls of the King traces the story of Arthur's rule, from his first encounter with Guinevere and the quest for the Holy Grail to the adultery of his Queen with Launcelot and the King's death in a final battle that spells the ruin of his kingdom. Told with lyrical and dreamlike eloquence, Tennyson's depiction of the Round Table reflects a longing for a past age of valour and chivalry. And in his depiction of King Arthur he created a hero imbued with the values of the Victorian age - one who embodies the highest ideals of manhood and kingship.